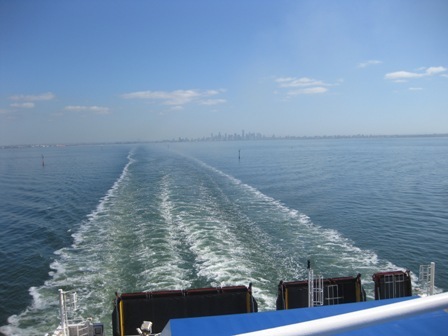 I was looking forward to crossing Bass Strait on the Spirit of Tasmania from Melbourne to Devonport. Bass Strait has a reputation for being rough. I was disappointed to find that on the day I crossed, Bass Strait was an effective mill pond with tiny one metre swells. Even so, several people became queasy with the slow rocking motion of the boat. The boat had obviously been through some storms over the years with many signs warning to be careful opening and closing doors and moving about the ship. On entering the wharf area, drivers are asked to check in any LPG gas bottles, which I did. 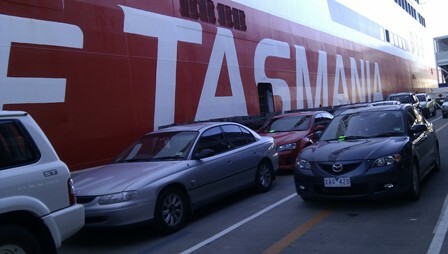 The gas bottles are transported separately on the Spirit of Tasmania. 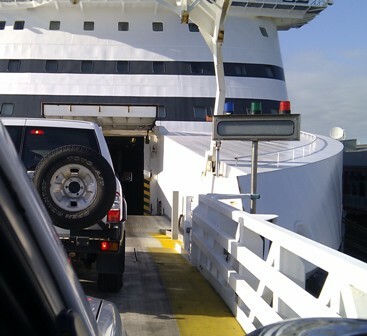 Vehicles then queued alongside the ship, waiting their turn to board. You are directed where to park on board. If you have a vehicle, like my Toyota Prado, that needs room behind the vehicle to open the tailgate to access the boot, take whatever you need out before boarding. Cars are made to park so close together that is was impossible for me to access anything in my boot once parked. 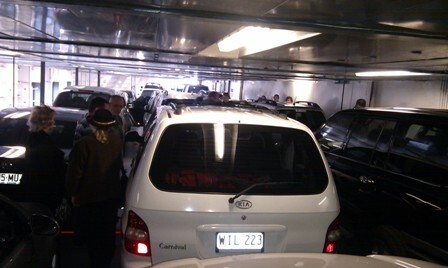 When the boat is under way, you are not able to access the car decks on the ship. Shipping is obviously speed limited in Port Phillip Bay because it seemed to take forever for the Spirit of Tasmania to leave the bay. 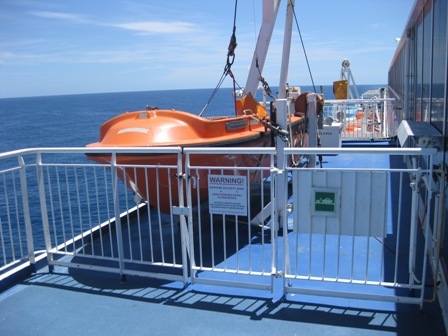 Once in Bass Strait, the ship picked up speed for the voyage to Tasmania. While there is on board entertainment, bars and restaurants, crossing Bass Strait is incredibly boring, particularly on a calm day. I made several circuits of the Spirit of Tasmania exploring the boat. My wife had booked me an Ocean Recliner seat. These are in the stern of the boat. If you are quite happy to occupy an airline-style seat for the trip, these are a good option. I did not spend much time in my seat. As this was a day time voyage, I preferred to move around the ship. About halfway across Bass Strait, you will often see the sister ships Spirit of Tasmania I or II heading in the reverse direction in the distance. 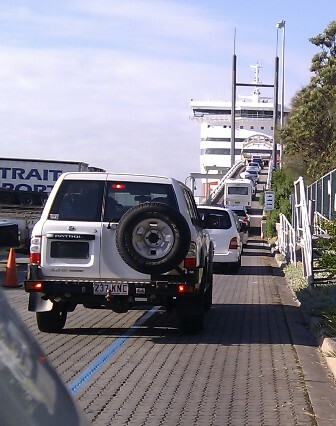 On arriving at Devonport, there is again a lengthy wait to disembark from the Spirit of Tasmania. 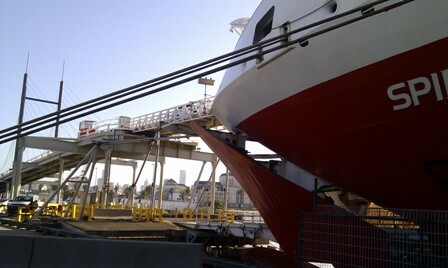 All vehicles need to wait their turn to leave the ship, and then all vehicles are checked for quarantine. Amongst other things, no fruit and vegetables are allowed from the mainland to ensure that pests are not introduced to Tasmania. Clearing quarantine, I picked up my gas bottle and headed for the camp site that I had booked for the evening at the Devonport Discovery Holiday Park. This entry was posted in Tasmania and tagged Holiday, Road Trip, Tasmania Trip, Travel on 22 December 2010 by Rex.